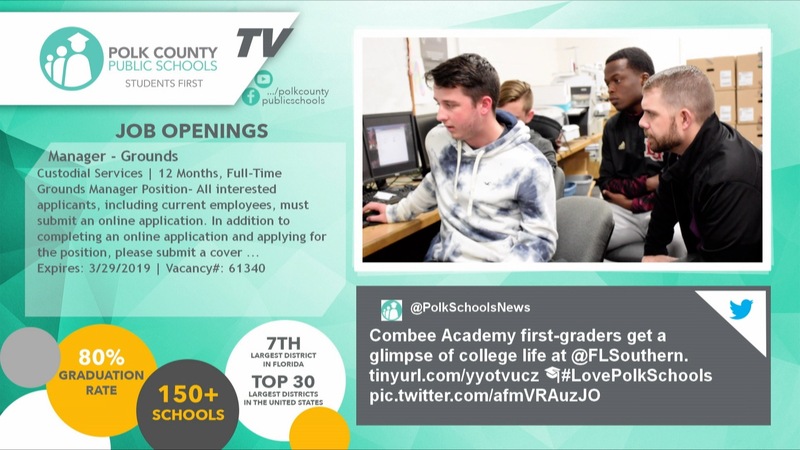 Polk County Public Schools’ TV channel is sporting more than a new look these days. The upgraded channel now features original videos highlighting our students and schools. Viewers can still watch broadcasts of School Board meetings, as well as recorded coverage of special events. The channel’s new layout also displays various job openings available with the school district, and streams news from our Twitter feed and event calendar. The centerpiece of the revamped channel — original videos — helps tell the interesting stories taking place in our schools, and showcases the hard work and talent of PCPS students and staff. The redesign and new video content featured on the channel is produced by district staff. The revamped broadcast channel is available on Comcast channel 7 and Frontier channel 45. Spectrum channel 642 is still being developed at this time. The original videos can also be viewed online through the district’s YouTube channel. In addition, the YouTube channel livestreams awards programs and special events throughout the year, including graduations at the RP Funding Center in Lakeland.